Fat Wreck Chords are releasing a limited edition 10-inch to celebrate The Fest's 10 year anniversary. 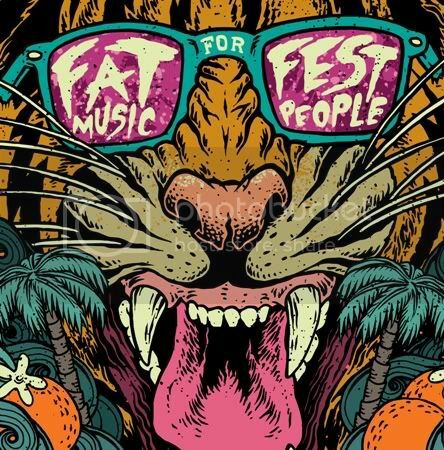 The release, titled Fat Music for Fest People, features Fat Wreck Chord bands that will be at this year's Fest including Cobra Skulls, Smoke or Fire, Dead To Me, Banner Pilot, Teenage Bottlerocket, None More Black, Paint It Black, The Flatliners, Old Man Markley, and Dillinger Four. The release is limited to 1000 pressings on 10 different colors. The 10-inches will be sold at the Fat Wreck Chords table at the Fest Flea Market October 28. The artwork, designed by HORSEBITES' Richard Minino, and track listing can be found below.